These days there is a war between different telecommunication companies on higher internet speeds. 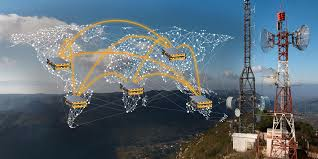 So these companies have launched their 4G network in various countries around the globe to provide better internet speeds and are even working on 5G network which will launch in few years to provide further better speeds. There are many companies in India such as Idea, Airtel, Vodafone, Jio and Reliance communication which have launched their 4G networks installed in India. These companies promise very great internet speeds of their networks. But have we ever got that speeds? The answer to this is simply no. Let's say a company is saying that it's internet speed is 150 Mbps, but getting this much speed is just a miracle. We can maximum get 10 to 15 MBps speed on our browser or torrent downloader and this much speed is also very rare. But when we check these internet speeds on a speed checker we again get speeds which these companies claim but while downloading we don't get these speeds. So the question arises that why these companies are claiming that much high speeds and we are just able to get 10% of these speeds which are also very rare. Are these companies making fool of us? No they are not. Actually these companies and speed checker always tell internet speeds in megabits per second while our browser measure speeds in megabytes per second. There is great gap between these two units. So we have to actually divide the Megabite speed by 8 to convert it to Megabyte. Let's take the above example that if a company says that it's internet speed is 150 Mbps actually we will get maximum speed of about 18.75 MBps of speed on our phone. This speed is also maximum and getting this much speed is also very rare.